The Virtual Birthday Party is still going strong! The official Chuck & Snerk home page! This site is a time-waster of the highest order! I finally made some long-overdue updates and there's still more to come. You'll find lots of fun news, information and pictures to brighten your day here, with new stuff posted every once in awhile. Check out the Fun and Games pages, links to my on-line photo albums, Snerk's Dive Reports, and the Musician's Corner section at the bottom! Adventure on the High Seas: Fukuoka, Japan! Twice! Jennifer was invited to go aboard the Japanese training fishing vessel the Kaiyu Maru for its return trip back to its home port of Fukuoka, Japan, with two of her students from Roosevelt High School. The first time they departed Honolulu from Aloha Tower on Friday, November 19, 2010, and arrived in Fukuoka, Japan on December 5th. The second trip departed on October 23, 2011, and arrived in Fukuoka on November 6, 2011. Click on the kanji for "happiness" to read her daily blog posted right from the ship! You'll also find links to pictures and a radio interview on Hawaii Public Radio's "Bytemarks Cafe" conducted after their return to Hawaii. Our dear friend Naomi joined me in flying over to Japan to meet the boat when it arrived in 2010, and we tagged along on all the tours. The Japanese people were so wonderful! We really enjoyed ourselves and can't wait to go back again! I have uploaded quite a few pictures, so click below and get started! I've uploaded tons of pictures to my new favorite on-line photo album site offered by Google. Some of the albums you'll find are from the Bark Park, Surfing, most of our Summer 2005 vacation and my trip to Boston's famous Fenway Park to see a Red Sox game. Check them out at http://picasaweb.google.com/chuckorama. AAAAAHHH!!! Snerk found my video on YouTube! My latest pictures are from the TV commercial I was in for Kirin beer! They have a new alcoholic beverage they are marketing in Japan and I got to juggle in the commercial! I think it will only air in Japan, but I am supposed to get a copy of the finished product. Meanwhile, here is the Internet version! Here is another version I found, but you can't really see me because I'm behind the guys in front. Our little kitten Pixie left us awhile ago, but little Chloe (aka Zena, aka Jabberwocky, aka the Krakken) has since joined our family and has been the light of our lives for the past two years. She hardly ever attacks us or bites our ankles any more. Bilbo is over eight years old now and he's the best dog ever! Click on Scooby-doo to see early pictures of Pixie and Bilbo. Here's some more pictures of Bilbo and Pixie, and here are some pictures of our new cat Chloe. There are also tons of pictures posted at the above Picasa site - some of Bilbo & Pixie, some from the Bark Park and some from dogsitting for our friends. And some from our new cat Chloe! My 40th year was a fantastic year for vacations! Evidently you are allowed to celebrate all year instead of just one day, so I planned and prepared to make the most of it. In the summer of 2005 we continued my 40th year celebration with a whirlwind worldwide spectacular vacation extravaganza! 5 weeks of constant fun and travel! We went on a river rafting trip down the Middle Fork of the Salmon River in Idaho (thanks Mark! ), then flew to Ireland and stayed with our friends the Milners for 6 days of rest and relaxation, then on to Berlin, Germany to visit Jennifer's sister Janetta, then to London for a few days, then back to Davenport, Iowa for the International Jugglers Festival! I've started uploading pictures to my Picasa web photo album site if you want to check them out. They're listed under "2005 Summer Vacation" titles. Jennifer and I have celebrated our 13th Wedding Anniversary, and we still find ourselves reminiscing about how great our wedding was! We celebrated our Two Year Anniversary at Disney World, and were also there for Christmas, New Year's, and a belated honeymoon. It was a great vacation! Here are links to our stupendous Disney World honeymoon page and our blockbuster wedding extravaganza. We love our house! We bought it on October 6th, 2003 and we're finally all moved in. Rennovation began shortly thereafter, and seems to be never-ending. I've been pretty good about documenting all the changes with photos, e-mail me for a link. Here's the new time-wasting section of the site (not like the rest of this web site...)! Fun and Games! The Fun page has tons of jokes and links to funny or entertaining web sites, and also useful web sites like the Internet Movie DataBase, or imdb.com. I realized how lame the old games page I had was when I stumbled across addictinggames.com, a monumental collection of time wasters of the highest caliber. I give it my full endorsement. Be sure and check out the classic putt-putt golf game while you're there, as well as my new favorite, Golphysics. I finally left my job at DISA after 9 1/2 years when the contract changed hands. I started January 19, 2004 working for a company called CACI, Inc., first as a network controller monitoring the network, then later as an Implementation Coordinator adding new stuf to the network. The job was located at Ford Island, part of the Pearl Harbor Navy Base. My new job is literally across the parking lot from the old one! I work for the Navy Marine Corps Intranet, or NMCI, monitoring the network. I like the hours and the people are pretty nice, and I get to expand my networking knowledge to new areas. Not too long ago I started on-line classes with Bellevue University to pursue my Bachelor's degree in Computer Information Systems (CIS). Bellevue gave me 60 credits for my Iowa State classes and Navy training, and I've completed an accelerated cohort program with them for Computer Information Systems which is good for another 30 credits, as well as a couple of other classes. Only 20 credits to go and I'll be a college graduate! 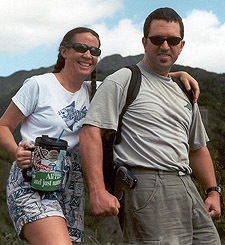 Here are some pictures from my famous Birthday vacation to Hawaii back in February 2000! This is where it all began. Here are Snerk's Dive Reports! That's right, you can read them all right here! I've also added a few pictures. Check out Malte's trophy near the end of Volume 11! Also, here's a special guest report from Dr. Richard Pyle. The famous PICTURES page is the place to go to see the long-lost pix of my grandparents, scary pictures of my hair, the amazing Super Chuckwagon Deluxe 'C' Class, the NEW Chuckwagon Millenium Edition, my motorcycle, and more! Also, here's the new on-line photo album repository I've started using: http://picasaweb.google.com/chuckorama. Lots of great new pictures there! 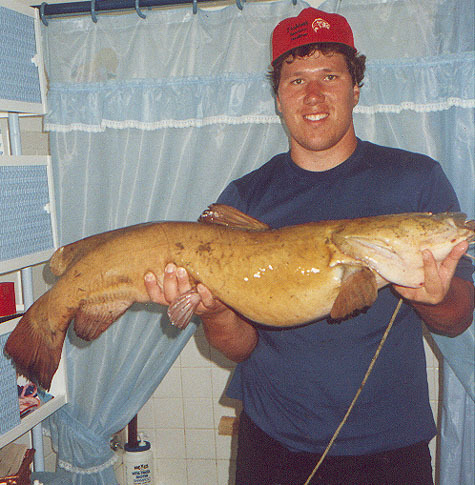 My brother Trent still holds the family record for the largest fish with his 26 lb. yellow catfish! UPDATE: Trent broke his own record in June 2007 when he came to visit us in Hawaii. 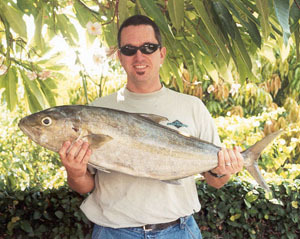 See my Picasa photo albums page for pictures of his 30-pound Ono! I've done extensive work as a strolling juggler and stiltwalker. If you are interested in seeing some pictures of me working, click on the dot. I've added some pictures of some of my new costumes since I moved to Hawaii. I recently retired from stiltwalking but can still be hired for juggling gigs. Every Monday night the Philadelphia Jugglers Club meets at Lloyd Hall right behind the Philadelphia Art Museum from 7 to 9:45pm. Here in Hawaii, the Rainbow Jugglers also meet on Monday nights from 8 to 10 p.m. at the University of Hawaii. Click here to get to their home page. It's free and open to the public and lots of fun! One of the hardest things about moving to Hawaii was giving up my pet snakes. I had raised 2 of them from babies and they were about 7 years old when I sent them to a good home. Snakes are against the law in Hawaii. I still have to post some pictures of my first snake Eve. Click the dot to see pictures of my old roommates. My best pal Joe Dituri is not just a great diver and instructor, he's so good he certifies fish to swim! Click the dot to check out his latest adventures with the Association for Marine Exploration. Click the sticker for the band that made me the King of All Roadies. I recently added a surprise for all the die-hard 'NOC fans, and just finished uploading some solid gold just in time for the holidays. Also, back from the grave, 'NOC now has a MySpace.com page. Will wonders never cease? Rob and Frank from WNOC have finally united with their younger brother Chris from Liquid Gang to form a new band. The Fabulous Holt Brothers have added the magical Jonny 5 and another guitar player to form Shovelhook. Their CD Release Party was unbelievable, you gotta get their new CD. Check their web site for a couple of sample MP3s and their gig schedule. You can also hear a couple of their songs on their MySpace.com page. My friend SONiA of the band 'disappear fear' made a dream of mine come true when she not only sang at my wedding dinner but invited me to sing with her. She makes beautiful, powerful music that speaks to your soul by revealing hers to you. She was recently selected for the Jeep Compass Uncharted Tour, and you can click HERE to see her Jeep promo video. It's pretty cool. SONiA also has her own MySpace.com page. I've know her since she was 'Beth Williams', and she sings like an angel! She has the widest range of any singer I know, and she can inspire tears of sorrow and regret or joy and laughter. In her second project, called Epiphany Project, she joins with her husband pianist John Hodian to allow another side of her creativity to blossom. You have to hear it, it defies description (it's amazing). Check her MySpace.com page too. This site updated 05/07/2014 and it rocks.